Following a sell-out inaugural release in New Zealand, Giesen is pleased to present a second vintage of Gemstone Riesling, its first wine from the 2018 vintage. Marlborough, NZ – Following a sell-out inaugural release in New Zealand, Giesen is pleased to present a second vintage of Gemstone Riesling, its first wine from the 2018 vintage. Giesen has a quality Riesling pedigree. Founders Theo, Alex and Marcel Giesen drew upon their German heritage to create Estate Riesling which they have made since their first vintage in 1984. Giesen Estate Riesling has become a favourite with Kiwis, being the highest selling Riesling in New Zealand by value and volume. It has won five consecutive Gold Medals at the New World Wine Awards and multiple trophies, including most recently; Champion Riesling Trophy and Champion Open White Wine Trophy, at the Air New Zealand Wine Awards 2016. Giesen Chief Winemaker Nikolai St George says in Marlborough 2018 white wines benefitted from above average temperatures early in the growing season, which allowed rich fruit flavours to develop. Warm overnight temperatures through the final parts of the growing season resulted in fruit with a slightly higher pH than usual, which gives this year’s Riesling wonderful texture and weight. Fruit for Gemstone was chosen from a single Awatere Valley, Marlborough vineyard because of its fantastic condition and concentration. Awatere fruit often shows classic Riesling citrus characters and floral notes, which was what the winemaking team want to express in this limited release. After harvesting in the cool, fruit was taken to the winery and immediately pressed to retain the purity and freshness of fruit flavours. The juice was then divided into three parcels for fermentation. A portion went into Giesen’s large German granite tanks, a second parcel went into 500 litre French oak barrels with at least four years age and the final parcel went into stainless steel tanks. After fermentation the wine was held on light lees for two months before the three parcels were blended ahead of bottling. Nikolai says it’s the inclusion of wine fermented and held in granite tanks which makes Gemstone Riesling so special. Granite is exceptional for stabilising temperature, tempering the heat generated by fermenting juice, storing the heat build-up and then returning it slowly when external temperatures drop, which all adds up to a wine with intense, mineral character. This year Giesen added its own new world winemaking twist to the centuries old tradition of winemaking with granite. During fermentation the original granite lids were used on the tanks which allowed air in, causing slight evaporation which added concentration to the wine. However, once fermentation stopped, Giesen replaced the traditional stone covers with floating stainless steel lids which the winemaking team specially designed. The new floating stainless steel lids stopped the passage of air which meant the wine retained its bright, clean fruit flavours. Nikolai says the 2018 Gemstone has exciting notes of luscious citrus blossom on the nose, opening out to a textured wine with balance, subtle sweetness, minerality and a long lingering character-filled finish. This special limited release Riesling really is a gemstone. Just as mother earth creates gemstones, Giesen worked in harmony with the earth, growing full-flavoured Riesling grapes which were fermented and matured in granite, creating a precious gem, Gemstone by Giesen. 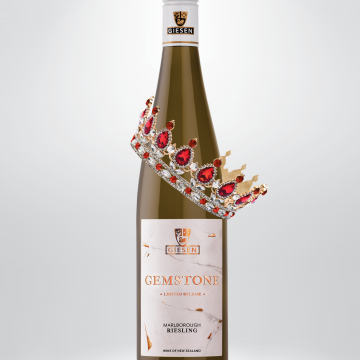 Visit the Gemstone Riesling page to read our 2017 & 2018 tasting notes. Gemstone by Giesen is widely available in fine wine retailers and supermarkets across New Zealand for $19.99 RRP. Become a friend of Giesen. We will keep you updated on all things fabulous. © Giesen Group Ltd 2019. All Rights Reserved.